I have breakfast issues. I’m allergic to bread and the texture of eggs makes my tongue want to cry. And then it’s winter a lot here, which makes it hard to think about lovely summer breakfasts like melon or smoothies or yogurt. Thank goodness for muffins! The genius thing about muffins is that you can freeze them. So that means you can make an enormous batch and then defrost them as you want them. You can do this by thinking ahead and laying them out on the counter overnight, or you can pop them into the microwave. Or, if you are as toaster-oven-happy as I am, you can just split them before freezing and then pop them into the toaster oven straight from the freezer, which makes them even warmer! These are not very sweet — you could add some granulated sugar if you preferred them sweeter — but are a flexible base that’s open to a lot of additions. I’ve listed some of my favorites at the bottom, but I also love them plain, split and toasted and buttered. Preheat your oven to 375 F. Grease or line your muffin tins. In a large bowl, mix the eggs, milk, yogurt or sour cream, oil, molasses, honey, and vanilla until they are combined. Add the dry ingredients — wheat bran, oat bran, flour, baking soda, baking powder, and salt — all at once. Mix just until combined. If you’re adding any extras, stir them in after the dry ingredients. 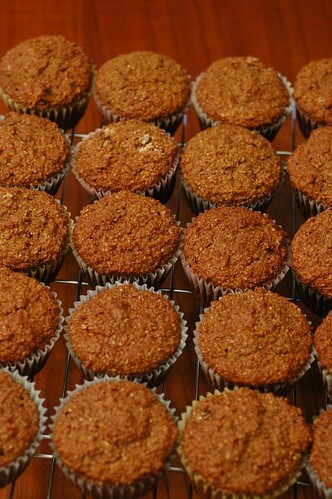 Fill muffin cups three-quarters full and bake for 22-25 minutes, until a toothpick comes out clean. I usually bake two pans at a time; if you do this, rotate them halfway. When they come out, allow them to cool slightly before removing from the pan. They’ll keep for a few days on the countertop or for months in the freezer. I hear the kind of people who like fruit in their muffins especially like blueberries in these. *It’s actually possible to use a wide variety of sweeteners here, including cane syrup, agave, or all honey. All molasses is a bit strong for my tastes, but works. I haven’t yet tried maple syrup; if you do, tell me how it goes! **I found Quaker-brand wheat bran in my regular grocery store, labeled as “unprocessed bran” on the front but clearly identified as wheat bran in the ingredients. If you have access to a store with bulk bins, you’ll almost certainly save some money by buying the bran that way.